Chili makes my family happy. I have a knack for making it, and I never make the same recipe twice. This is chili is extra spicy. If you don’t like heat, I recommend that you leave out the jalapenos. If you have sensitive skin you may also want to wear kitchen gloves while preparing the jalapeno peppers. Always remember to wash your hands thoroughly after handling them as well, and never touch your eyes or sensitive skin with fresh jalapeno on your hands. 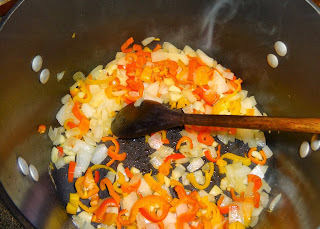 Sauté the onion and the garlic in the olive oil, over medium heat, in a large pot, for three minutes. 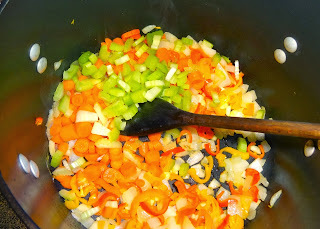 Add the steak, carrot, celery, and bell pepper and continue cooking for five more minutes, stirring often. 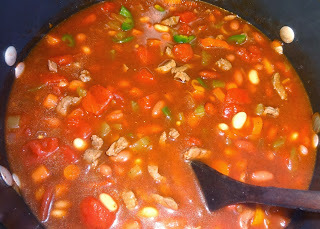 Add the puree, diced tomatoes, jalapenos, beef and chicken broth, chilies, and beans. Cook the mixture over medium to medium-low heat for about thirty minutes. If the chili becomes too thick, a little water can be added. Salt the chili to taste after it has cooked. We like to top our chili with shredded cheese, chopped onion, and sour cream. Enjoy!